Meet Rapunzel, the main character from the Disney movie Tangled. She uses her hair to climb into the tower where she lives so it's a bit messed up now. Can you restore her beautiful long, blond hairdo? First give it a washing, then select a new hairstyle and finally give her a lovely makeover! Queen Elsa of Arendelle, also known as The Snow Queen, has long platinum blonde hair. She always wears it in a left side braid or as a French braided crown twist bun. But today she felt bored of usual look so she wants you to give her a lovely new haircut. Can you help her with a new makeup too? Ariel is finally getting married to her prince. Before her wedding she wants to try out several hairstyles and makeup styles for her big day. Can you help style ariel's hair and give her a makeover? 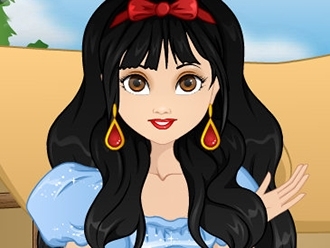 Have fun playing princess dress up games with sky breeze!